The Fraunhofer FOKUS business unit Future Applications and Media contributed to Physical Web open-source project. 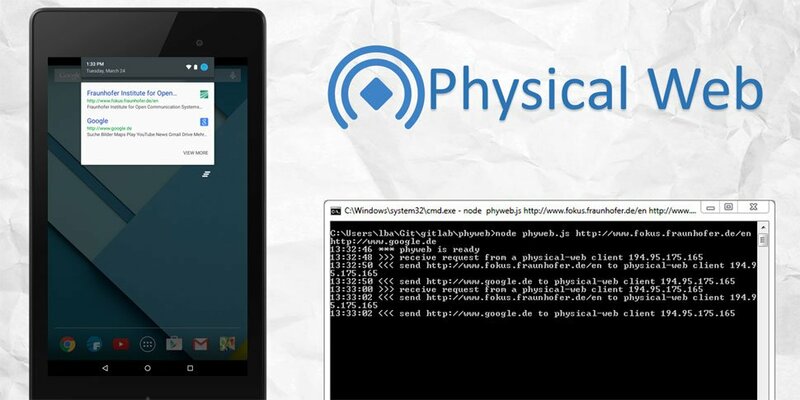 Physical Web extends the web we know into the physical world around us. This involves creating an open ecosystem where physical objects like vending machines or bus stops can broadcast URLs into the area around them. Nearby companion devices such as smartphones or tablets can then see these URLs and offer them up to the user. The original concept for implementing Physical Web uses Bluetooth Low Energy (BLE) beacons for broadcasting and receiving URLs. The UriBeacon specification is made for this purpose. This concept allows any BLE-enabled device to receive and read the URL. Fraunhofer FOKUS' contribution proposes in addition to BLE a new mechanism for broadcasting and receiving URLs in local networks based on the Simple Service Discovery Protocol SSDP. This will limit the visibility of broadcasted URLs to devices in local network which is required in non-public use cases. Fraunhofer FOKUS' contribution includes also implementations of the proposed concept for receiving URLs in the Physical Web mobile application for Android and iOS. The SSDP implementation for Android is now available in the current Physical Web App on Google Play. A Node.js based implementation for broadcasting URLs over SSDP is also included in the contribution.